Finding top veterinarian care is a major concern for any dog or pet owner. As the owner of a Pug this becomes a little more of a concern because Pugs are more susceptible to certain ailments. Almost any pure bred dog is a little more “delicate” than your average breed. In this section we’ll discuss the key conditions Pugs are more prone to have as well as how to find the proper veterinarian care for your little friend. Keep in mind that, although the conditions listed below affect Pugs more than other dogs, it does not mean that you dog will definitely get them. The point here is to make you aware of the ailments so that you question your vet on your Pug’s health. The biggest concern with any Pug is the shape of his head. Although it’s what makes them absolutely adorable, the flat face of the Pug can cause problems with breathing. Pugs are called a brachycephalic breed. The structure of the head makes them have a flat face and can result in some respiratory problems. This is especially true in the warm weather so be careful not to get your Pug overheated in the summer. Ask your vet about this and the recommended exercise regime for your Pug in both the warm and cooler weather. Breathing difficulties can also occur if you take your Pug on an airplane so, if you’re planning to take your dog in a flight or even on a long car ride in the summer, make questions about travel part of your veterinarian care question and answer session. Pugs are also prone to eye injuries. This is due, again, to the shape of their head. Their eyes “bulge out” just a little bit so it’s a more common occurrence for a Pug to rug his eye against something. Obviously if it’s a sharp object it can cause a serious injury. We love Pugs for the way they look. Their unique facial structure makes them unbelievably cute but it’s also a little bit of a weakness for them. We’ll reference specific questions for your search for a vet but we think experience with eye injuries ranks high on the list of topics. Pugs are also prone to dental problems and skin disorders. Of particular concern are the Pug’s teeth. A Pug has 42 teeth. That’s a lot of teeth to fit into that tiny head. Over-crowding is a very big concern and extra care for your Pug’s teeth and gums will go a long way to keeping you both happy. Part of good veterinarian care is a full dental check up. There are other things to consider for your Pug as part of a comprehensive veterinarian care program. Pugs are susceptible to all the skin disorders other dogs are but they are also a little more prone to allergies. 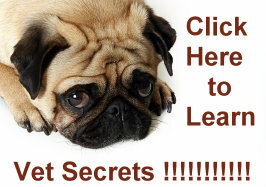 This makes allergic dermatitis something to watch out for with your Pug. There are many types of allergic reactions that you may see in your Pug such as sneezing or sniffling but you may also see other problems such as scratching or licking or even biting the skin. It will not take long to develop irritation in this area that should be treated. Your vet may recommend a topical treatment or a hypoallergenic shampoo. With severe reactions your vet may also recommend a dietary supplement containing essential fatty acids such as biotin or Omega3. It may take a while to figure out exactly what is causing the reaction in your Pug and, although your vet may have a lot of experience, he will rely on you to keep track of what your dog eats and what he’s been doing that may be causing the reaction. Remember, you are one of the key ingredients in getting top veterinarian care for your Pug! One other condition that affects Pugs is a deformation of the hip. This is called hip dysplasia and is actually a dislocation of the hip than can be very painful. It can even cripple your dog in severe cases. It’s caused by the way the femur fits into the hip socket. If it doesn’t fit correctly it can cause friction and cartilage damage. The joint inflammation can be treated with glucosamine. That’s the substance that keeps the joints lubricated. In severe cases surgery may be necessary. Clearly there is a lot to consider when you are making a choice of veterinarian care. Asking the vet if he or she has experience with Pugs and with the conditions listed above will set you apart from 90% of the other dog owners who choose their vet out of the phone book. You might even want to investigate a vet who practices alternative medicine, After all, you want to have the best care possible for your little friend. A Pug can’t tell you what’s wrong with him and there’s nothing more sad or frustrating in not being able to help your dog when he’s not feeling well or is hurt. One of the things you can do in researching your prospective vet is to ask your breeder who they recommend. If you got your Pug at a pet store ask them about what they’ve heard about certain vets. Ask your fellow dog owners as well. One thing to keep in mind is the office hours that your veterinarian keeps. Often they are part of a network so there’s always someone on call to take care of you Pug in an emergency. The extra care that you take in selecting veterinarian care for your Pug will be time well spent. For the most part vets are a very caring and compassionate group who want to provide you with the best care possible. Very few of them went into this career for the money and the amount of education that you need to be a veterinarian keeps all but the most dedicated and committed people out of the profession. One thing to be aware of is the fact that you have to be comfortable with the vet as well. You’re entrusting this person with your lovable little Pug’s life. You want to be completely happy with the care that your dog is getting as well as with the relationship with the vet. You want someone who will take the time with you and answer the questions that you have. You want someone with experience who will be able to spot problems early and explain them to you to your satisfaction. The bottom line is that you want a vet who is going to give their full attention to your dog. In rural areas where most of the vet’s business might be with larger animals such as horses and cattle, this may be a problem. If you feel like you’re being rushed – find another vet. You want someone who will answer every question you have and be fully involved in your Pug’s care. If the office assistants seem to be doing most of the work and the vet walks in for a two minute visit and then leaves – find another vet! You want someone who will give their full attention to you and your Pug. Obviously, veterinarian care such as this costs money. Costs should not be the only thing you consider when interviewing a vet. An annual exam of $200 may sound like a lot more money when compared to another vet who charges $75 but make sure you look at what you’re getting for the money you spend. If the $75 covers the annual shots and little else you may end up with a problem down the line that will cost you far more than what you’re saving and could have a disastrous impact on the health of your little friend. On the other hand, if the higher priced exam is a complete physical and a battery of blood work and tests with a full consultation included, you might be getting the bargain of the century. The pet insurance industry has sprung up to address the dilemma most pet owners have between quality health care and high fees. It may be something worth looking into. We all know the best advice: never compromise when it comes to taking care of your Pug especially when it comes to veterinarian care.